Making the change to a greener way of living has been one of the best decisions of my life. True, it was not easy and making a leap to alter any part of your life can shake your foundations. It shook my foundations for the better. What makes it easier is knowing the good that comes from living a more sustainable life, with less plastic and waste. Not just for the environment but also my own life. The everyday has become less complicated as certain consumer choices have been removed. The choices I make are centered around kindness to myself and the world around me. Simple, wholesome choices. I think that if you are here, there is something inside you that sees a kindred spark in a sustainable life that is free of unnecessary plastic and waste. You might not be ready to flip your whole world on its head and paint it green, and that is OK. I am still learning to live a sustainable life myself. Here are five steps focusing on shopping that I have incorporated into my life to make myself a more sustainable shopper. Becoming aware of where a product come from and how it is created has given me power as consumer. All of my choices, including how I shop, affects the planet, animals and other human beings. With the internet at our fingertips we can easily dig up information on a brand. Knowledge is power. By NOT supporting a brand that is neither sustainable, eco or ethical I am sending a consumer driven message. There is responsibility and influence in how I spend my money. With the rise of quality second hand shops, online swap sites, Ebay, Etsy, Gumtree or Craigslist it is hard not to find what you are after. Making second hand my number one choice when shopping has saved me money and you never know what treasures you will find. The three Rs (Reduce, Reuse, Recycle) has a mighty sister called Refuse. When I want to buy something I check in to see if I really truly need it. I ask myself questions like, does it have longevity? is it purposeful?Second hand shopping can be a little bit harder as that particular dress or kitchen item I might have in mind is not always sitting there in a store for me. Second hand shopping can be like a lucky dip! This is when I find myself making do with what I have or borrowing from friends and family as the effort usually ends up outweighing my desire for it. The construction of a bag, whether it is made of paper or plastic adds on the carbon foot prints too. I have two bags that I always keep with me. One is for food shopping and the other is for clothes, shoes and miscellaneous. That way I do not worry about anything food related mixing with that bargain shirt that I thrifted earlier in the day. This is my favorite tip to share. You know how some wallets have a plastic (eek!) window for photos or licence? In the place of a photo I scrawled a quote to remind myself each time I am out shopping of my choices. 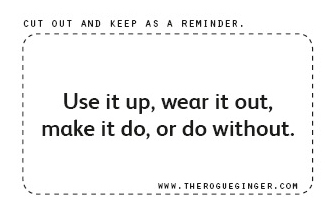 The quote I use is 'Use it up, wear it out, make it do or do without'. It is an old wartime quote that reminds me to think before I hand over my cash. I have created one for you to print and pop into your wallet. Print this little gem and put it into your wallet or somewhere that will remind you. Right click the image, save to your desktop, print and cut. Make sure you recycle the paper you do not use. Or as an alternative write the quote on a scrap of paper. (Confession: mine is scribbled on the back of an old receipt). 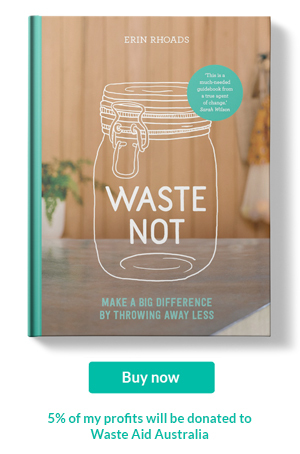 These five steps have helped me become a smarter, sustainable shopper. I would love to hear in the comments below what helped YOU become a more sustainable shopper.